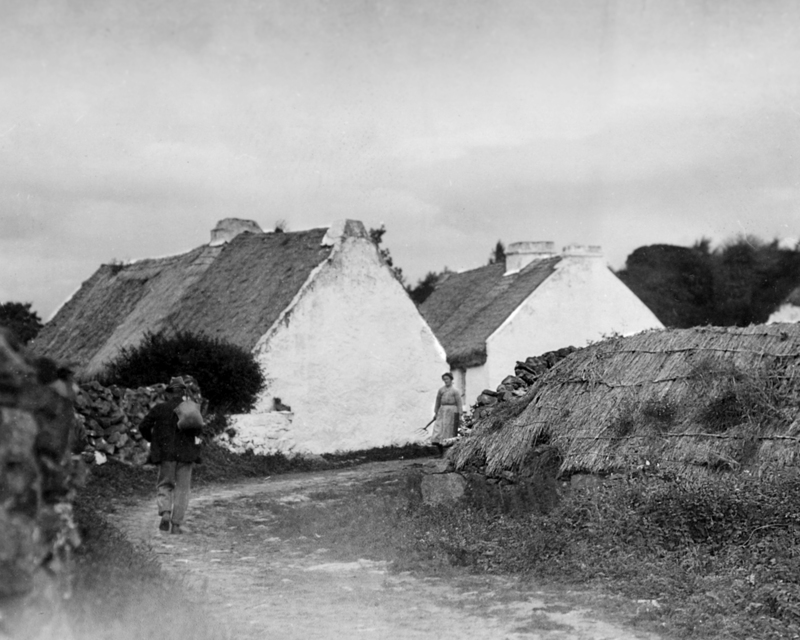 The first thatched house in the picture of Cregg in Féilire 2012 was the home of Mike Faherty, the second house was the home of Ellen Walsh (Helen Mc Quinn’s grandmother), the third building was a cowshed. The houses appear very near each other in the photo but in fact there was quite a distance between them. The man carrying a sack over his shoulder is Mike Faherty – he is coming from the bog or more likely the village with his weekly shopping. Ellen is carrying a flat pronged fork which could have been used to dig potatoes. An alpine or a small cactus plant with pink flowers grew beside Ellen’s house. Members of the household referred to it as ‘Buachaill an Tí’. If there was an impending death in the family the plant would come away from the wall and the family would stick it back in again and it would continue to grow. People considered this plant to be a blessing.